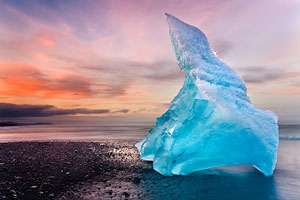 Join award-winning landscape photographer Brian Rueb and Scott Donschikowski, as they lead a photography tour through the rugged beauty of Iceland. Rugged mountains, geothermal hotspots, enormous waterfalls, lush moss-covered valleys, glacially-fed lagoons, and black sand beaches. Iceland is a landscape photographer's dream location. Positioned at 66° north latitude, the sun never fully sets in the summer months. Here, it's possible to enjoy the beauty of a sunset as it fades right into sunrise! This can mean up to four or five consecutive hours of great light to provide more opportunity to come away with those amazing images. 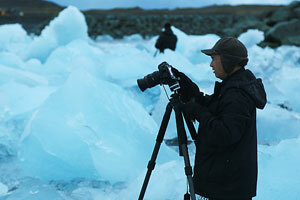 We'll be photographing waterfalls, fields of lupine, chunks of cool blue glacial ice, and much more! In the summer of 2010, Brian spent over two months in Iceland photographing for a book project, and most of the time he was on foot. 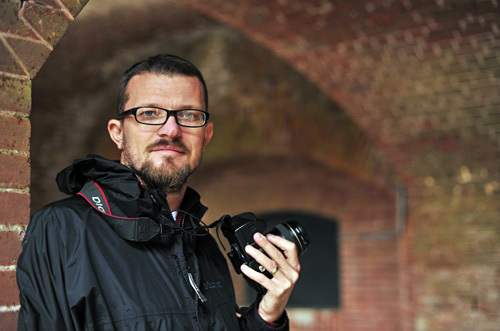 He has seen the country firsthand, and combined with his photographic resume, he is the perfect guide to show you everything that makes this country so special. You'll meet Brian and Scott in Reykjavik for orientation before setting out for over a week of exploring and photographing this truly unworldly landscape. You will arrive in Iceland's lovely capital city where Brian will meet your group for an afternoon orientation and go over what to expect for the trip. 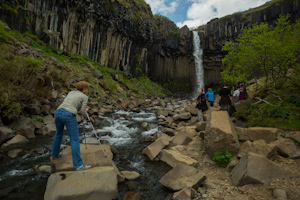 You will be given time to unpack, grab a nap and eat before meeting that evening to head out for the first night of photography, when we will take a drive and photograph the mighty Gulfoss waterfall, and the lake and waterfall in  Ingvellir National Park. We will depart and arrive in Vik, a good city to use for a base of operations. 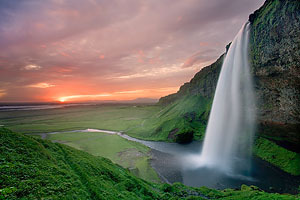 We will spend the next two evenings photographing iconic waterfalls Skogafoss, Seljandsfoss, and the coastal areas in and around Vik with its black sand beaches and interesting basalt formations. 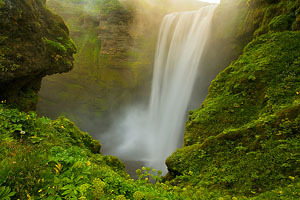 In addition to these iconic locations, there are numerous "little" waterfalls, Icelandic horses and opportunities for possibly seeing and photographing the Atlantic puffin. Each evening we will be out photographing from 8 or 9 in the evening until 2 or 3 in the morning, making the most of the long arctic sunsets. We will move east across the country to Vatnajokull National Park. During the next two days we will photograph the park, its snowcapped mountains, waterfalls, birch forests and glaciers. 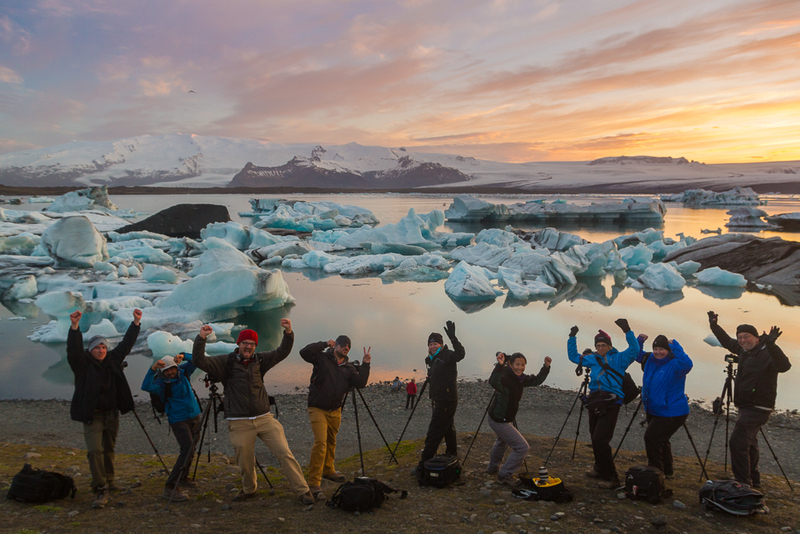 We will also spend considerable time at Jokulsarlon, the iconic glacier lagoon. 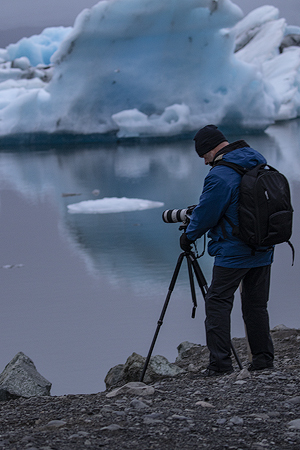 Whether we're in a secluded secret cove that Brian knows, or walking the black sand beach photographing the chunks of ice washed ashore, the evenings will be spent photographing some of the most amazing landscape Iceland has to offer. We will head north and experience diverse and amazing scenery. Our nights will be spent photographing icons like Dettifoss, Godafoss, Selfoss, and the geothermal wonders in Lake Myvatn. Whether it's powerful waterfalls or the textures and sensory experiences provided by the steaming geothermal activity, our camera cards are going to fill fast in this section of the country. We're off to the west coast, to glacial mountains, rocky coastline, waterfalls and mountains! This portion of the trip will be spent photographing the gorgeous Snaefellsness peninsula. We'll see the odd volcanic coastline near Arnastapi, the axe-shaped Mt. 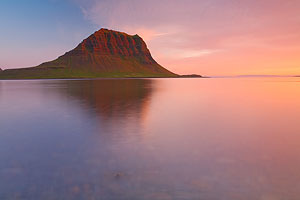 Kirkjufell, as well as other interesting destinations like the icy blue water of Barnafossar and Hraunfossar, two very distinct and gorgeous spring fed waterfalls. Back to Reykjavik! We'll spend our last night in the Reykjanes peninsula photographing some of its interesting volcanic areas and coastal secrets. Iceland is a varied and amazing landscape. We will do our best to follow the light and see and photograph as many beautiful locations as we can in our time together. Be prepared for long nights of photography. It isn't uncommon to spend 5-6 hours an evening in amazing light. Bring plenty of memory! We will use the days to rest, process images, and eat. There may be a few small optional day trips for anyone with the energy to head out. These will be discussed during the morning, and dependent on weather. We will arrive back to the hotel early this morning after our 10th night of shooting at the Blue Lagoon and Reykjanes Peninsula. Typically we arrive back to the hotel around 1-2am. Those who have early flights can get a few hours of sleep before heading to the airport later that morning. Those who have scheduled a later flight out, or are extending their stay on their own can come shoot some of the local sights in Reykjavik if the weather is cooperating; including the Harpa concert hall, and the Sun Voyager sculpture. Our group often meets for one last goodbye over breakfast to make sure everyone has exchanged contact information. We will be staying in traditional European-style tourist class hotels. All hotels are very clean and provide comfortable places to sleep. Each room is equipped with a bathroom, and many have a small television. Most of our hotels will be equipped with wi-fi for free or a small fee. Expect to find clean, comfortable rooms with individual bathrooms. We will be driving from location to location in the largest van available, to be sure we can provide ample room for luggage, all our gear, and our comfort, as we enjoy photography each evening. Our workshop is designed with the serious photographer in mind, and since the prime light in Iceland runs from 10 pm until 3-4 am, you should expect long nights. Because of the length of this quality light, we will try to hit 2-3 quality stops each night and spend as much time as it takes to get those magic moments captured on our cameras. We will assemble between 7-8 pm every night to go over the evening's shooting, answer questions and depart for our nightly spots. Every effort will be made to follow the light and keep our driving times to a minimum. Our hotels are located as close to our selected spots as possible, with locations dispersed between the driving, which will minimize our drive times to an hour or two at the maximum. Our group size is limited to ten students to maximize our instructor's ability to work with students as needed to help provide the best experience at each location. Brian has spent many hours in these locations scouting and photographing them, and knows each spot well, so he can offer you suggesstions on how to make your images the best possible. The van we drive holds 15 people, so there will be room for you and your luggage on days we transfer to a new hotel, and on the evenings when we shoot you will have some room to spread out and relax. Price includes: Hotel accommodation for ten nights, breakfast at the hotels, transportation during the workshop, and instruction. Price does NOT include: International airfare to/from Reykjavik, optional activities such as the blue lagoon, lunch and dinner (due to weather conditions and changing photography times, planning community dinners and lunches isn't feasible), excursions, alcoholic beverages, guide gratuities, additional days beyond trip dates, trip insurance. Non-Photographer Spots: Due to the capacity of vehicles, the price is the same for non-photographic passengers. Payment Schedule: To secure your spot, a non-refundable deposit is required. A wide variety of national and international airlines are available that regularly fly into Reykjavik. Iceland Air flies routinely out of New York, Boston, Minneapolis, Orlando and Seattle. Most flights require layover on the way to Reykjavik, so plan accordingly to ensure you arrive on Friday at a decent hour. The summer has the longest periods of time for photographing, and typically the mildest and most pleasant weather. Being close to the arctic circle can mean dramatic weather patterns that deliver wind, rain, and even snow. Your clothing should have layers that plan for high temperatures in the low 70s, and low temperatures in the 40s. You should include layers that protect against wind and rain, as well. Currently U.S. citizens are able to travel in and out of Iceland with only a valid US passport. If you are arriving from other countries, please check your local government office to find out the current requirements for travel from your country of origin. We recommend you contact your travel physician or health care provider for the most up-to-date recommendations. → The workshop/tour price includes room, in-country transportation, admission to the Blue Lagoon, and some meals. Hotels will provide breakfast every morning. (We will be out during the day and you will need money for lunch.) NOTE: Your airfare to/from Reykjavik is your responsibility. → The workshop is limited to a total of ten students. → Weather in Iceland is very unpredictable. We can and will probably witness every kind of weather imaginable - wind, rain, possibly some snow, and sunshine. It's possible to see all of that in one day. The unpredictability of the weather is part of what makes photographing Iceland so amazing. Storms come and go regularly, creating very dramatic skies. Given the length of sunset/sunrise time in the country, it's possible that what appears to be a dismal day can break and leave you with hours of good photography. Having a vehicle will allow us to travel to areas where the weather is the best for shooting. What kind of shooting hours will we have? → Iceland in the summer is light all day long. It never gets so dark you need a light to read. The best time for photography is from 9 pm to 3 or 4 am. This tour will put you on a different schedule than you are used to. The nice thing is that because of all the light, your body typically doesn't feel as tired at the end of a day as it does under normal cycles. 7-8 pm: Meet in hotel lobby to depart for shooting. 9 pm-3 or 4am: Photographing as many locations as we can! 4 am: We will arrive back at the hotel. Breakfast usually runs until around 9 am. Some participants may wish to take a nap before breakfast. 1 pm-2 pm: We will make an afternoon run into the nearest town for lunch, and sightseeing. NOTE: On days we have dinner in our hotel, we will meet at 6 pm to eat before departing on our nightly photography adventure. We will also make ample stops at grocery stores to allow people to stock up on snacks to bring with them on the road. What kind of physical demands will there be? 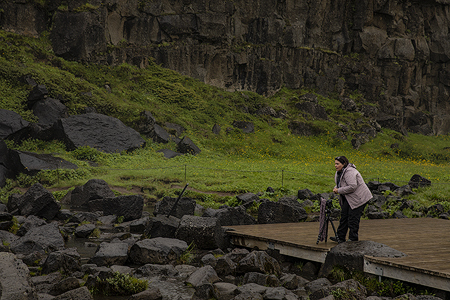 → Iceland has something for everyone. Luckily, many of the iconic and most beautiful areas to photograph are located very close to the main roads. We will walk between 4-6 miles a day (some days less); it depends on you as to how much you want to walk at some of these areas in search of great compositions. → In reality it's more of a photo tour than a workshop. In order to fully appreciate the wonders of photographing Iceland, ideally you've had some experience photographing. Brian will drive, and take you to the best places at the best times of day as is customary for Aperture Academy workshops. Once you're at a location, he will be available for any questions or concerns you have with how to shoot a location, what areas are best, settings, etc. Then you'll be on your own to explore and shoot. By all means, if you need help, ask... but unlike our shorter, more introductory level workshops, Brian won't be next to you all the time. You'll have freedom to really explore the locations. Then in the hotel, or during free time, feel free to ask him for any critiques or ideas. → Some days more than others. We will be photographing for a long duration of time each evening. The idea is that from the time we return from shooting, until we depart for our next location or to go photograph, that time is yours. If you need to nap, go for a walk, work on images, it's up to you. Brian will give some basic times if people wish to head into town or go sightseeing, but it's up to you whether you go or stay. → Yes, that is an option, but due to the amount of space in the vehicle we'll travel in, if they accompany us, they must pay full price. What is the room situation? → All rooms will be double occupancy. You will be paired with another solo traveler of the same gender. If you are a traveling with someone and would like to share a room, please contact our studio to let us know! What type of hotels will we be in? → In Reykjavik, the hotel standards are similar to those you would find in any large European city. In the country, the hotels are often buildings that are converted for summer's tourist season. They are often dormitory-style rooms with a small bathroom, very nice and clean, but nothing extravagant. → Most things in Iceland are a higher price than in the US. We will make every attempt to help you with the best spots to eat at the best prices. Lunches are often at fueling stations where hot-dogs and the like are served at reasonable prices. → Due to booking arrangements, the $1500 deposit is non-refundable. I have a lot of little questions, who should I contact? → Ask Brian, he will be glad to personally assist you with any information you need to make your trip easier to plan, and more comfortable. The workshop fee is $5995. A $1500 non-refundable deposit is required to secure your space. On February 1st, 2019, 50% of the remaining balance will be due. Please Note: Returning students discounts are not applicable to Sojourn Series workshops. A++ experience. Brian and Scott's knowledge of the country and locations, the logistics, and the available assistance were all top-notch. One of the best trips of my life, highly recommended. The Iceland trip was amazing. 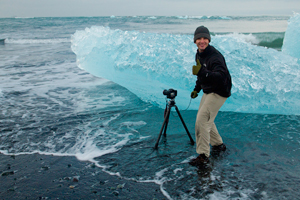 Brian knows that island inside and out, and he brought us to the best locations to shoot sites like the amazing waterfalls and one of a kind icebergs. My favorite spots were Diamond Beach and the horse farm. Brian’s knowledge of Iceland and his wonderful teaching style made this a very fun and informative trip. I highly recommend the Iceland Photography Workshop. We had a great time and Brian's knowledge of taking us where the best light is at a given time was priceless. I will definitely be signing up for more workshops with Aperture Academy. […] Aperture Academy arranged the hotel rooms, transportation, and where to eat. We never felt lost or felt unattended to. I will take advantage of their alumni discount and will arrange more dentists for future workshops. Thanks Brian and Aperture Academy!! It was truly a memorable trip... good company, good food, and some amazing photo opportunities that sometimes bordered on the surreal. What a spectacularly beautiful country. Thanks, Brian and Scott for a fabulous adventure (and your expert instruction). Another amazing trip with the Aperture Academy! Thanks to Brian and Scott for their dedication and patience. I had a blast and learned some new tricks. I look forward to my next workshop. Brian and Scott invested a lot of research into Iceland prior to the workshop, which provided a lot of value during the workshop. Both were very helpful in preparing us for the next shoot and very flexible to the group's needs. Scott's expertise in Lightroom opened up new doors for me when we were not shooting. If you have never travelled with Brian or Scott, it is a very fun and often hilarious experience and I felt I was in good hands the entire time. I really appreciate the 1-2 punch method of visiting key sites...if one day did not have favorable light, a return trip was usually planned to improve success rates. My only complaint is that Brian and Scott eat too much junk food...but they are in such great physical shape that I think they can get away with that. This workshop is ideal for anyone who wants an introduction to Iceland photography without the hassle of finding locations. This workshop was an amazing photographic adventure. I really enjoyed the entire trip. Brian knows Iceland very well and has developed an amazing itinerary. This trip is very highly recommended. You will not be disappointed.